Frigidaire as a brand are extremely popular for their Air Conditioners and Dehumidifiers. However, not many people have heard about their Range Hoods. 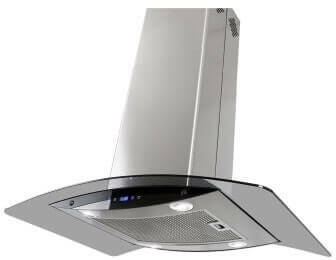 Even though these range hoods aren’t the most popular of the lot, they do perform better than most. One may even go to an extent to say that they’ve tried to overshoot their goals manufacturing range hoods, nevertheless it fits right into their stronghold – Air Purification and cooling (Isn’t that the main function of range hoods?). 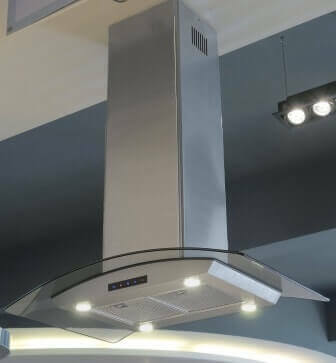 This Frigidaire Island Mount Chimney Range Hood – FHPC3660LS is a true 36 inch masterpiece thanks to the attractive stainless steel finish that helps enhance not just its looks, but the overall appeal of your kitchen. Ideal for homes with medium exhaust needs, this island mount range hood runs smoothly and quietly with a 400 CFM Internal blower and a three speed centrifugal fan. With the provisions to encompass 4 bright halogen bulbs, the hood also provides extra lighting over your cooking range. The stylish glass canopy blends with all sorts of kitchen décor and would look stunning when installed. There’s just one drawback though – the price. First and foremost you should know that this range hood is pretty heavy, weighing a whopping 88 pounds. When comparing weight, make sure you only compare with other Island mount hoods as they do have another entire plate (Closed on all 4 sides). That being said, it’s obvious that you’d need help while installing this particular range hood. Bearing the following dimensions: 23.6 X 35.3 X 22.9 inches, it would comfortably fit in most kitchens. Before we proceed, you must know that some customers have complained that the installation instructions received along with the pack weren’t exactly to precision and the template wasn’t as accurate as one would want it to be. The screws for the duct cover are black - Yuck! Obviously the manufacturers didn't bother about aesthetics when they manufactured those. Nothing to worry about though, you could always buy your own screws which aren't heavy on the pocket at all. In total they provide you with 4 screws to hang the frame, but they're provided in really tight quarters as specified by one customer, he solved this problem by installing with lags instead. On a positive note, the FHPC3660LC Island Mount Range Hood can be converted into a recirculating type (with the addition of charcoal filters). This is what you’re going to need in the cold winter months as you’d want to keep the warm air of your kitchen within your own walls. Height with Ceiling Mounting Bracket - 32 29/32"
Does the Range Hood come with a Plug or does it have to be hard-wired? 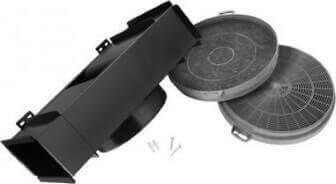 The range hood doesn't come with a plug, just like most island range hoods it needs to be hard-wired. If you're interested you can Check out other answered questions. This product may look attractive and feel right, but it’s really expensive, you’d get 2 island mount range hoods for the price of one if you just picked another brand. If you do happen to buy it, make sure you buy the extendable warranty too, because only then would it be worth your money. Any huge investment calls for a lot of thought, so check out some of the reviews written by people back on Amazon. A few of the other merchant sites that we checked out do sell it, but the price was even higher and there weren’t any reviews to link to.